The prelude to this train journey was plentiful. It was in every guide book, blog, and Instagram feed. 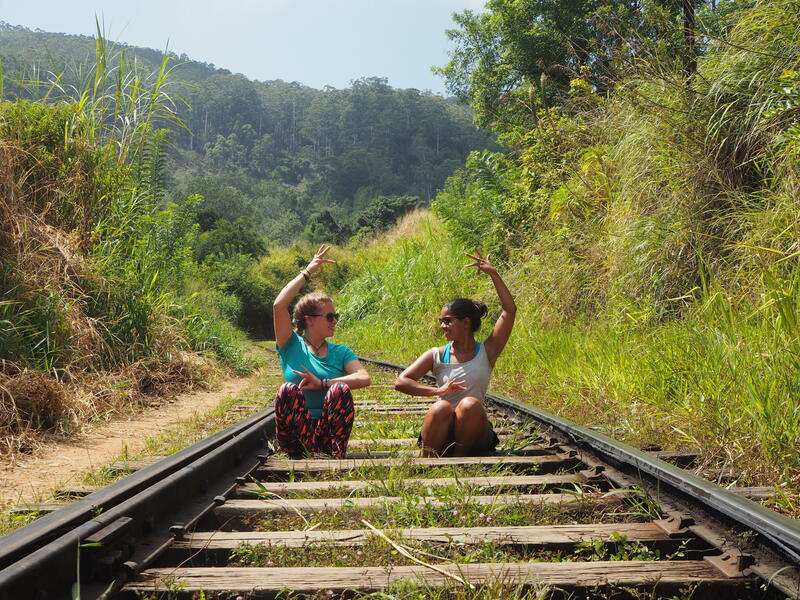 The inevitable question from every traveller was “You’re doing the train, right?” It would be a travesty not to – after all, it was in the Lonely Planet Top 20 Things To Do In Sri Lanka! So we put it in our itinerary, did some research, and decided we’d wing it once we got there. Rookie mistake? Once we got to Kandy, we tried our luck in getting a seat reservation at the station, but were told it was all sold out. We would need to come back the next day, an hour before the train, and get an unreserved ticket then. Our hostel receptionist simply laughed at us when we told him we didn’t have a ticket, and assured us we’d be standing all the way. We’d heard about a ‘travel hack’, which was to get on at Perideniya (one station before), and try and get a seat before the crowds at Kandy. ‘Will that work?’ We asked him. He giggled again. ‘No!’ We walked away to the sound of him sniggering. And so we arrived early that morning at Kandy Railway Station, fearing the worst. After handing over 240 rupees each for a second class unreserved ticket (just over £1), we waited on the platform. And waited. And waited. The previous train sat there, unhurried, for over an hour, and finally left at 11.10am – the same time ours was supposed to. The anticipation grew. The number of foreigners waiting on the platform increased, and we all strapped on our backpacks, ready to jump on the train at a moment’s notice. The determination on everybody’s face was clearly visible, and we were ready to elbow people out of the way, if it meant getting one of the precious, elusive seats. The whistle blew. The train rolled in. Which carriage was which class? It didn’t matter. We piled in and sat down. Quite easily, we were surprised to note. And a few more seats were even left empty. It took another 30 minutes for the train to start moving, and within another hour or so, our local companions had alighted, leaving us with the window seats. Score! The rain began after an hour and the accompanying cool breeze was a welcome relief after the heat we’d experienced in Trincomalee and Kandy. We breathed in the fresh air, trying to clear our lungs of the soot and exhaust we’d ingested in the cities, whilst trying to shield our possessions from the pelting raindrops. 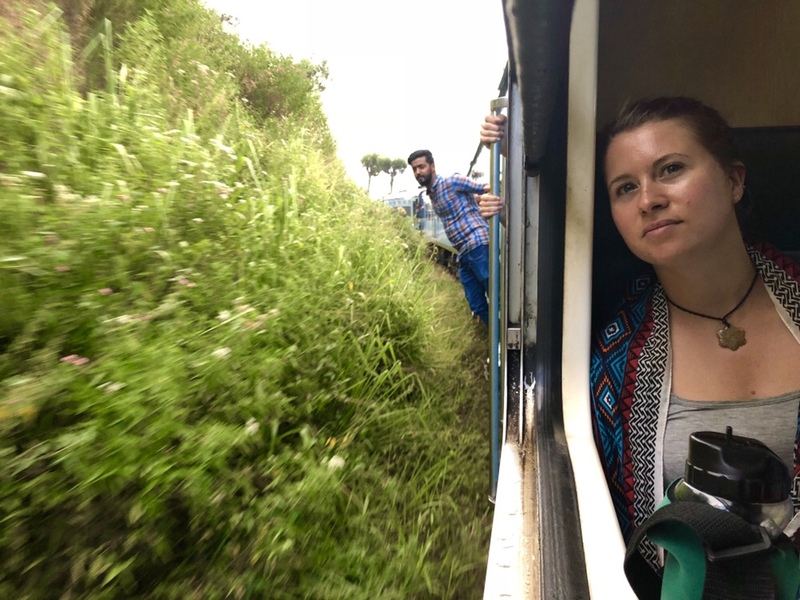 We had expected it to be too crowded to even sit, but in reality we stretched out and read our books as we chugged through the Ceylon countryside. Heads lolled as various tourists caught up on sleep. The Hamilton soundtrack played in my headphones for the millionth time. I stood up to stretch my legs whilst other tourists hung out the doors and snapped hundreds of photos whilst trying not to tip over the edge. Various sellers wearing the traditional lungis wandered through the train, shouting about their wares: chai, crispy wade, and spiced pineapple, all encased in newspaper or even old homework paper. We were wary of hygiene, and so we stuck to crackers, nuts, and I munched on my new favourite fruit, mangosteen. Locals jumped on and off the train at various points, whilst the foreigners were all clearly in it for the long haul (one of our companions even missed his station as he was so caught up in the countryside!). 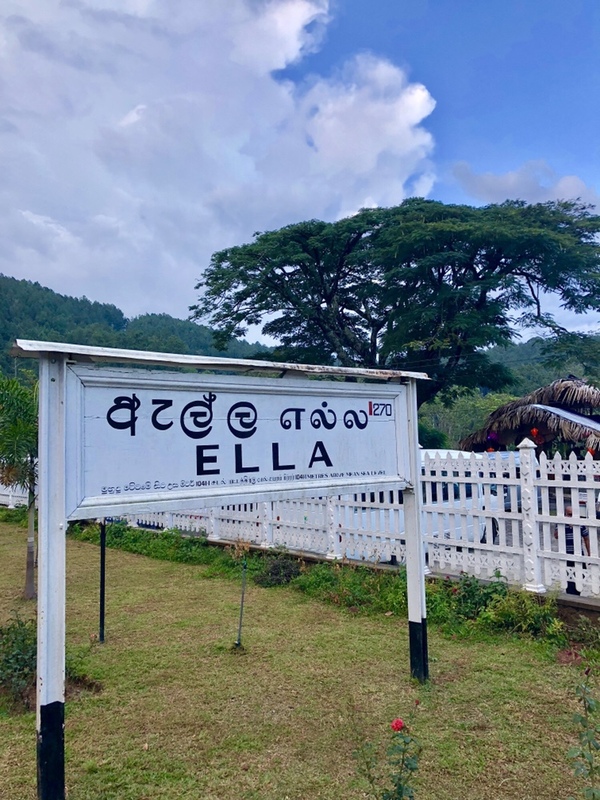 Rest assured, this train is definitely not the most direct way to get from Kandy to Ella. Built by the British, it ignores how the crow flies, loops around to the east, and rattles through at an average pace of 40km/h, so it took us 6 hours to get there. But despite all the warnings about standing all the way, we somehow managed to beat the system. How? Maybe it was because we took the later train (11.10am rather than 8.45am), as most tourists assume getting up earlier puts you in a minority, thus negating your advantage. Maybe it was off-season. Maybe some people don’t want to spend nearly an entire day on a train. Either way, it was ridiculously cheap, and we caught some beautiful scenery when we weren’t catching up on sleep, so if you’re willing to risk it, I’d highly recommend this journey. Regardless of how you get there, Ella is an enchanting and wonderful town. 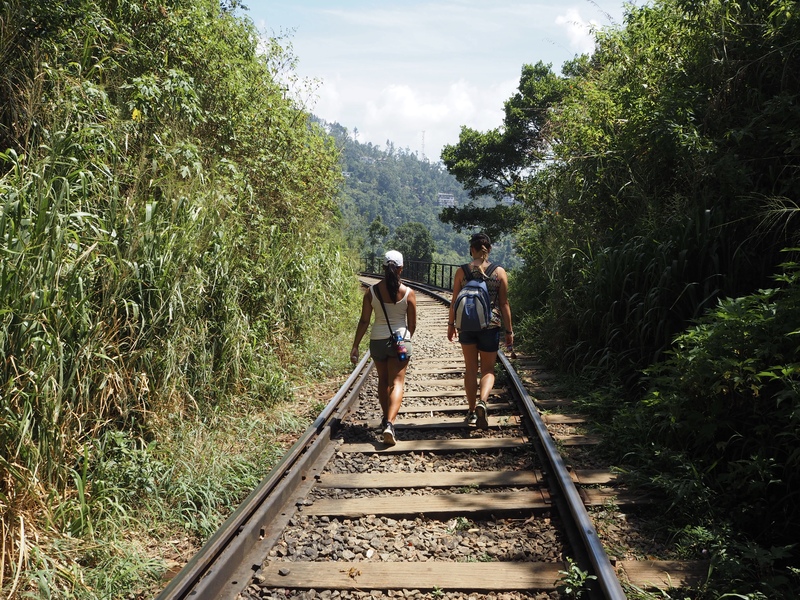 We did a few small hikes, ate a lot of food (more on that soon), and one of the things we enjoyed most was just walking along the train tracks to get anywhere and everywhere. This felt almost more magical than travelling on the train itself!